Outsourcing Debt Collection Services - Hire a Debt Collector or a Lawyer? Outsourcing Debt Collection Services – Hire a Debt Collector or a Lawyer? So, your emails and phone calls are getting you nowhere? It’s time to outsource your debt collection services to a professional. But which one should you hire – a debt collection agency or a lawyer? Here are a few tips to help you hire the correct professional to do the job. 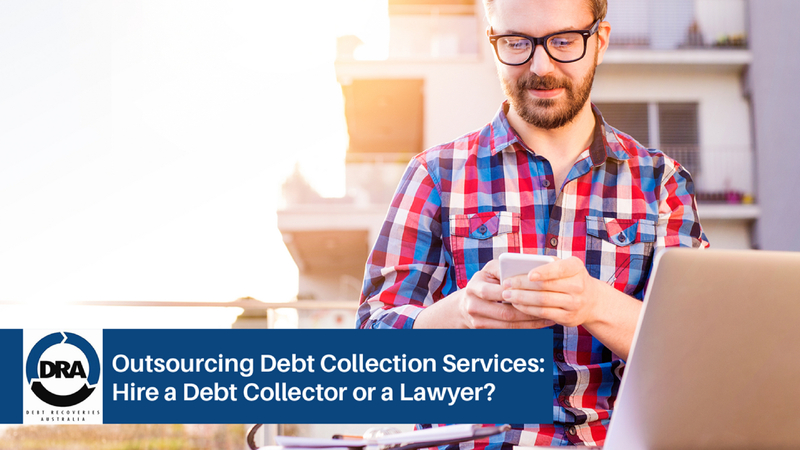 If you’re choosing either a debt collector or a law firm, make sure that the collector that you choose has a specialty in that area. Find out exactly how fast you need the money. If you are looking at cash flow and you want your money fast, it is better to ask assistance from a debt collector than go to a law firm. Keep in mind that legal processes take longer time. Debt collectors operate on a commission basis and are incentivized to get the money in. They don’t get paid unless the debtors pay their debts, so they are motivated to collect your debts faster. You need to look at the commission you will pay to a debt collector as opposed to the legal fees you will pay to a solicitor. With debt collectors, the commission fee depends on the size of the debt. So, if clients have a very large debt, you might want to consider the legal option. Debt Recoveries Australia (DRA) is a debt collection agency that can provide litigation services across Australia and New Zealand. DRA collects debts from companies of all sizes – small and large. Partnered with ADC Legal, which Adam is also a director of, DRA can maximise recoveries and speed of collection while being responsive to our client’s individual needs. Adam Stewart is Debt Collection Expert and owner of Debt Recoveries Australia. We are experts at recovering your outstanding debt without the drama. For more information, email at us email@debtrecoveries.com.au or call 1300 799 511. Talk to us about your debt collection concerns via Skype at debtrecoveries.